DIPS Academy, which is not only renowned but also award winning Institute in India by giving results year after year in CSIR NET, IIT JAM, GATE and UPSC made crash course program for the students of CSIR NET aspirants who just need to brush up their concept in short interval of time before going to the exam. This Crash Course Program is most suitable for those students who have knowledge of all, the concept which are in the curriculum, but he just needed the guidance to crack the exam, then he can join this program which is run for the time interval of 40-50 days evenly by taking classes for 6-8 hours in the weekdays. The classes are given by experienced faculty members of the DIPS Academy under the guidance of award winning mentor Mr. Rajendra Dubey. Every Student is awarded with study material which has enough material for the aspirants to crack the exam. In the CSIR Crash Course Program student can also provide with separate doubt clearing classes. The study material which is provided to the CSIR Crash Course Student is designed in such a manner so that the student does not need any kind of study material other than that to prepare for the examination. We are famous among the students of maths and stats from all over the India for the preparation of CSIR NET, IIT JAM, GATE and UPSC. 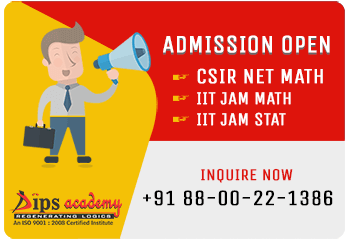 So if you want to clear the exam like CSIR NET, IIT JAM, UPSC and GATE with good rank then join DIPS Academy, which has stood as a Market Leader from Last 20 Years in the field. Apart from Study material CSIR Crash Course students can also access to our Video Library, which has a collection of videos of all classes so that if he want to learn the concept again, then he/she can see that particular video till they can learn that concept. This library is unique in its own way as it is classroom recorded with HD Quality, it gives the illusion to the watcher that Dubey Sir particularly giving classes to that student on that particular concept.